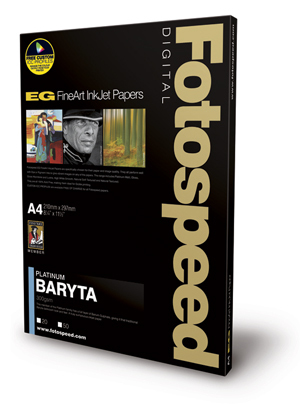 Fotospeed Platinum Baryta is a smooth gloss surface with a hint of a warm tone. The print quality is deep and rich, similar to a silver-halide bromide print. The overall image errs on the side of dark almost to the point that some shadow detail is lost. This will be down to the profile, which can easily be rectified with an adjustment layer or Curves in most image-editing applications. The gradation has a smooth transition from deep black through to paper white, and the greyscale patches show good separation from the third patch upwards. This media together with the profile would be a great choice for photographers who want to create a sombre mood. 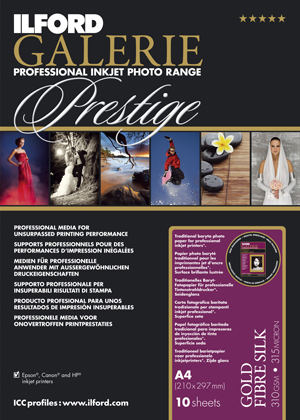 Hahnemühle has a very high reputation among fine-art photographers for its range of quality media. 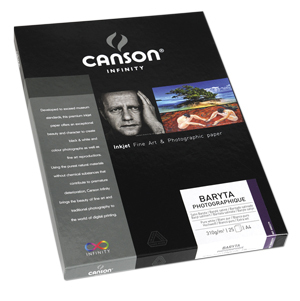 However, the Glossy FineArt Baryta FB 350gsm paper proved a disappointment. There is an overall slight magenta cast on the image area, which is down to a poor profile. The shadow areas display a similar effect to reticulation on film (break up of emulsion). The gradation at the dark end isn’t smooth the black and greys. On the four darkest greyscale patches there is a lot of reticulation, which is also evident on the actual image, although a lot is hidden by the texture of the stone pavement. The Canson media at 310gsm has a good photo-quality feel. I downloaded the profile from the Canson website and applied the recommended printer settings. The result is a gloss print with a broad range of tones. The blacks are well defined with good separation from the dark greys. The buildings have retained all detail in the white paintwork, and sufficient detail in the dark wall in the foreground. The gradation has an ultra-smooth transition from black to white, and the greyscale patches display a clean separation between each shade. The light greys have no visible colour cast, which indicates that this profile is a perfect match with our test printer. 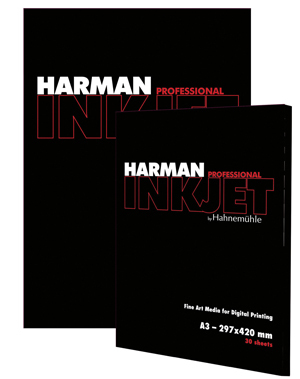 The Harman Gloss Baryta paper produced a clean, well-defined print with excellent tonal quality throughout. The black areas deliver good punch, but without sacrificing image detail. The white buildings jump out from the darker surroundings yet still retain detail. The paper base is not a pure white, instead having a soft warmth that is implied rather than seen. The profile Harman supplies via its website is spot on. The gradation ramp displays a silky smooth transition from black to white and there is excellent separation on each greyscale wedge. The 320gsm paper weight gives the print sufficient rigidity to convince anyone that this is a high-quality product. This Delta Matt paper is the only matt-surface media in this test. It has a bright white paper base, which will be popular with photographers who want a clean-looking image. The matt surface does mute the blacks to the point that they almost become a dark grey. The overall print has a light, airy spacious feel and would suit subject matter with a lot of shadow detail. Matt surfaces are also popular with fine-art photographers, mainly due to the non-reflective quality of the media. Both the front and the rear surfaces of the paper are similar in colour, but only one side is coated – be sure to print on the correct side. Ilford has been at the forefront with black & white photography and it follows that the company should produce a dedicated paper for b&w work. 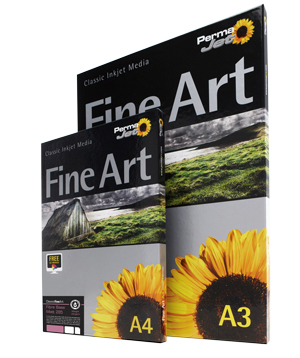 The Gold Fibre Silk is a 310gsm media with a light creamy colour paper base. Our test print displays a good tonal range from white through to solid black, with detail retained in both the shadow and highlight areas. The light creamy colour does distract from the pure white buildings, so this paper will better suit portraiture and landscapes. A free ICC profile for our Epson printer was downloaded from www.ilford.com. It is spot on for accuracy and produced an accurate print of the image. The gradient is very smooth without any banding, and the 11 greyscale patches display well-defined separation. Baryta is a barium-sulphate coating that is applied to fibre-based paper prior to other coatings. The benefits of the Baryta layer include greater detail and definition, extended tonal range and excellent archival properties. 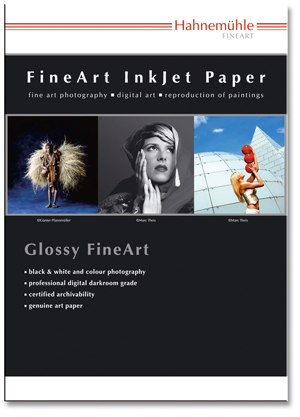 Fibre-based papers are highly recommended for fine-art and limited-edition printing. From this review, we tested each paper using an Epson Stylus Pro 3880 pigment-ink printer, having downloaded and used the manufacturers’ custom profiles for the relevant media. Other than that, our black & white test file was not altered for this review. All prices are taken from www.on-linepaper.co.uk.